Sir William Stanhope (1702-72) 2nd son of the 3rd Earl of Chesterfield bought Alexander Pope's Villa in 1745, though he did not actually occupy the property until 1748. He probably enjoyed the tenancy of Pope's garden from the various copyhold owners who first leased their land to Pope, although by 1758 he had bought them all out. 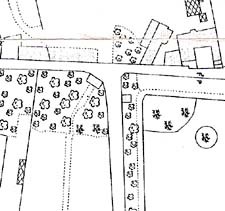 In 1761 he bought the property diagonally across the lane ('Back Lane' or 'Worple Way') at the top of Pope's garden, from Ambrose Scudamore Winde. There had been a house on this land, occupied in the winter of 1747/8 by Henry Fielding. Fielding had tried to buy the property but had been out bid, probably by Winde. Stanhope then constructed a 'cave' in the corner of the garden leading to a tunnel beneath the lane, giving him private access from his garden. This openly admiring quatrain attempts to invest Stanhope with credit for improving the villa and its surroundings. This was something which, at least in respect of the garden, Horace Walpole found objectionable, noting that Stanhope had tidied up the garden, clearing much of the shrubbery, and replacing it with a perimeter wall. He also extended the villa with wings and added a pediment to the centre bay, so converting it into a mansion more suited to his presumed station in life. Nugent was known to Pope and they had corresponded over a long period. He had donated some minerals ('mundicks') for the Grotto in 1740. The cave was a minor pantheon in Stanhope's honour containing, according to a visitor in 1789, 'three beautiful busts of Sir W Stanhope, his daughter and Lord Chesterfield, cut in Italian marble; opposite each a Roman urn of exquisite workmanship placed in a niche formed in the wall; around are scattered huge masses of stone in imitation of rocks'. Somewhere, too, space had been found for a marble bust of Pope himself. Today, Stanhope's Cave lies beneath Radnor Road, now widened from a lane into a highway, taking a slice from the top of Pope's garden. 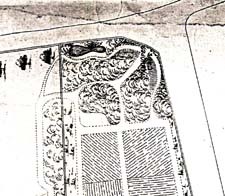 An 1873 Estate Plan notes the position of the Cave at the top of the garden. There is a path leading towards it through a shrubbery, and a small pond nearby. By 1900 the pond had gone and there was a small building marking the position of the entrance cave. The proposed widening of the lane, which can be seen on the adjacent land was carried out soon after this and the entrance to the cave was brought forward to its present position. The tunnel is in private ownership, approached only from the property across the road, known as Radnor Lodge, which has been formed partly from the 18th century stable buildings. Stanhope probably demolished the house, retaining the stables for his own use.